Now, though, it’s the French who have it figured out. 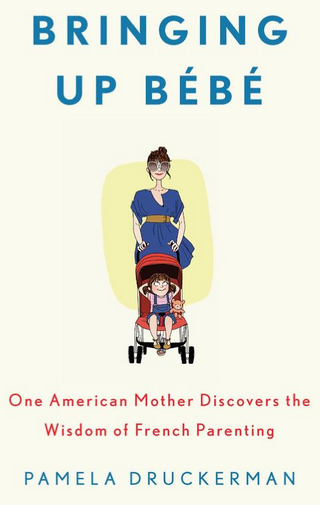 Just like Chua’s book, journalist Pamela Druckerman’s recently released “Bringing Up Bebe” — which lauds the “wisdom” of French parents, who love their children but don’t live for them the way American parents do — has hit the bestseller lists. Another new parenting-by-comparison book, “How Eskimos Keep Their Babies Warm,” extols the virtues of the Argentines, who keep Baby up late for special occasions, and the Japanese, who let their kids fight it out. Such frenzied fascination with foreign parenting raises a question: Are American parents really that bad? The simple answer is no. Of course we love our children and want what’s best for them. Our problem is that we’re not sure what, exactly — in our driven, achievement-oriented country — is best. Perhaps instead of snapping up the latest foreign fad or obsessing over every international test score ranking, American parents would do well to look no further than a very American ideal: the pursuit of happiness. The American stereotype is pervasive: the hovering helicopter parents who rush to prevent a toddler from falling on the playground; worry that their child isn’t zooming through Piaget’s stages of development; are hawkishly on the lookout for any signs of giftedness; stay up late perfecting that popsicle-stick diorama of Fort Ticonderoga for their second-grader; ferry the middle-schooler to travel soccer, violin, ballet and fencing lessons; demand online grade books to check up on a high-schooler; call and harangue college professors; and now, according to a recent report on NPR, submit grown children’s resumes, sit in on job interviews and demand a “Take Your Parent to Work” day. Researchers who analyze what people do with their time have found that, on average, American parents indeed spend more time with their children than parents in other developed countries. (French fathers? From time studies, you’d think they didn’t even have children.) American mothers who work outside the home — and that’s three-fourths of all moms, many of whom work full-time — spend more time with their children today than stay-at-home mothers did in the 1960s. They do so by forgoing sleep, personal care, housework and any shred of personal leisure. Their “free time” is largely spent with their kids. Still, surveys show, they worry it isn’t enough. And new studies are finding that the same breathless time stress is becoming an issue for young American fathers, who, like mothers, are juggling intense demands at work and increasingly intensive standards for what it means to be a good parent. While the intensity is at its most acute in the middle and upper-middle class, she said, her studies have found that low-income parents feel the same parenting pressures, compounded by the guilt of having neither the resources nor the time to meet them. But if French parents are calmer and more confident, it’s not just because their parenting standards aren’t as intense. Another reason is on the corner: In France, that’s where you find the crèche, a government-subsidized child-care center where virtually everyone, after a four- to five-month, state-subsidized, paid parental leave, sends their children — working and at-home mothers alike. In contrast, the United States is one of only three countries in the world, along with Swaziland and Papua New Guinea, that have no federal paid parental leave policy. After President Richard Nixon vetoed the Comprehensive Childcare Act of 1971, which promised to ensure quality, affordable child care, American parents were left to fend for themselves. In a country that pays its child-care workers less than its janitors, that is a time-consuming, expensive and often fraught search. Child-care costs, which consumed 2 percent of the average family budget in the 1960s, now take up 17 percent, according to the U.S. Department of Agriculture, second only to a mortgage or rent. At the crèche, Druckerman, with typical American fears about “institutionalized day care,” worried that she’d be consigning her child to the DMV. Instead, she found the Canyon Ranch spa. After that, her children went on, like all French children, to the state-subsidized ecole maternelle. The 34-country Organization for Economic Cooperation and Development ranks France No. 1 for 100 percent preschool attendance, even though it’s not mandatory, while the United States ranks toward the bottom, with 46 percent. The absence in America of the crèche on the corner symbolizes most profoundly how Americans are still fighting the exhausting Mommy Wars: whether it’s better to sacrifice career and education and stay home with Baby, or cobble together expensive child care and schlep into work in a guilt-induced haze. If French parents are more relaxed, it’s also because they tend to parent the same way, using what Druckerman calls a discipline cadre — setting firm limits, teaching patience, granting autonomy. But this unending, merciless judging of other parents in the name of what’s “best,” this constant comparing of ourselves with parents in other countries, this gnawing fear that kids are falling behind and our nation is losing its superpower edge, point to a deep insecurity that is not only draining American parents but fostering insecurity in American children. To Christine Carter, a sociologist with the University of California at Berkeley’s Greater Good Science Center, the answer for American parents is in our Declaration of Independence: the pursuit of happiness. What she teaches in online parenting classes is that, in our achievement-obsessed culture, we have it backward. “The underlying American assumption is, if our kids get into a great college, they’ll get a great job, then they’ll be happy,” Carter said. “Our cortex of fear is around achievement. So, in order for our kids to get into a great college, get a great job and be happy, we get them piano lessons, after-school Mandarin class, we think more, more, more, more, more is better. And it blossoms into such pressure that by the time the kids get to college, about a quarter are on some kind of anti-depressant or anti-anxiety medication. Our hovering and insecurity as parents breeds insecurity in our kids by teaching them that they can’t handle discomfort or challenge. And really, what more could parents — of any nationality — want for their child than that? Brigid Schulte is a Washington Post staff writer and a New America Foundation fellow. She is at work on “Overwhelmed,” a book about time pressure and modern families.